Bark Bark... Corrina here. That long name doesn't really suit me very well, please just call me Corrina. 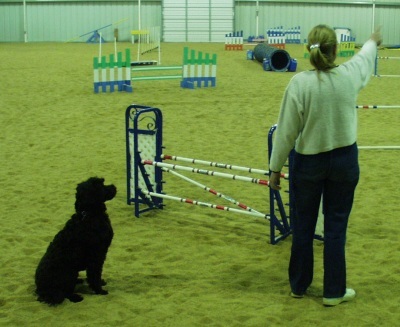 I'm a Portuguese Water Dog and I live with my human mom Connie. We both live with Hale, Luxo and Stubby (the cat and supreme ruler of the house). Luxo has his own web site too, and since he has included all of the appropriate PWD information there, i won't repeat it here. Luxo's web site is at http://www.ata-atapi.com/luxo/. I especially like the swimming section! 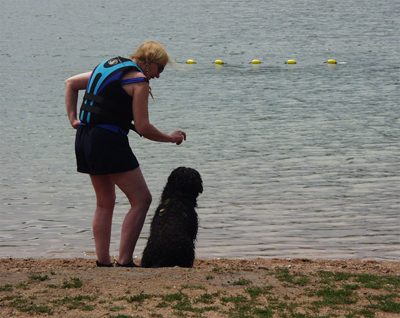 Corrina completed her Apprentice Water Dog title on July 18, 2004 at the Colorado PWD Club's inaugural water trial at Chatfield Park in Denver. The previous day she completed her Junior Water Certificate. WHAT A DOGGIE! There are some photos of the water trials available at http://www.copwdc.org/wt2004.htm, some of which feature Corrina (you'll know it's Corrina because Connie is the handler). There are a few photos available in the Water Work section below. Here's a photo of me sitting in my spot on the sofa with my princess pillow and teddy bear. Life as a dog around here is really tough as you can see. My technical specifications (health and breeder info) are available by clicking here. My pedigree is also available. You'll have to type it in since i don't want to start getting a lot of spam because someone harvested my address from this page. Very early in my life i put together a little web page, but no humans posted it. It is now available by clicking here. This page is presented as it was originally written, so much of the information is out of date. My dear friends Heidi and Coco have since gone to the Rainbow Bridge to wait for their humans to join them. No one lives at the wonderful place in California any more, but we visited my mom (Phoebe) and brother (Sailor) in Florida in February 2001 and in Michigan in September 2002. Both places seem to be as nice as Bonnydoon was.